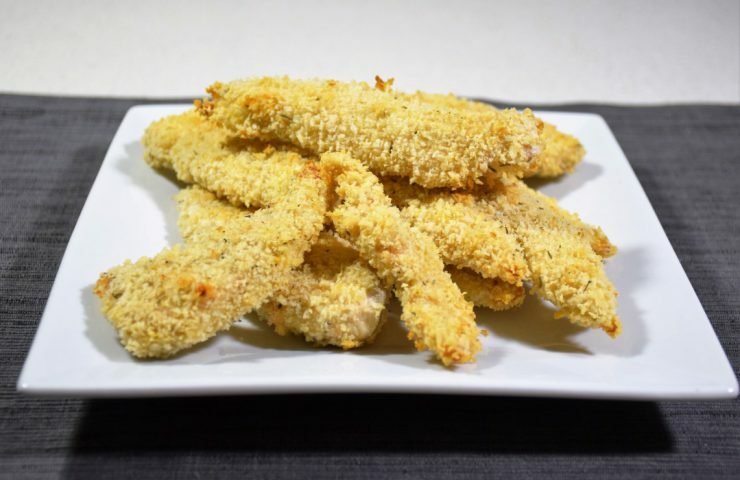 I was recently doing my weekly grocery shopping on AmazonFresh (one of the many perks of living in downtown Seattle – I feel spoiled having my groceries delivered to my door) and I discovered Just Bare chicken breast tenders. I immediately thought about how much easier making homemade chicken strips would be and I knew I had to add it to my menu for the week. I realize that cutting chicken breasts into small strips isn’t that difficult, but for some reason I really dislike doing it. Using these tenders eliminates that step in the meal preparation and results in a quicker, easier meal (whether it’s chicken strips, fajitas, chicken salads or even appetizers). 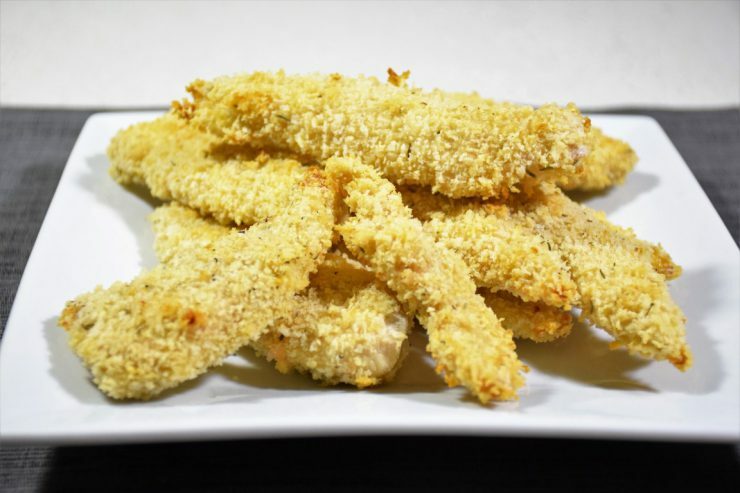 Not only is this an easy meal to prepare, it’s much healthier than traditional fried chicken strips since they are baked. They can be made in advance and frozen to help get dinner on the table faster during the week. These chicken strips make a great salad add-on; I oftentimes add them to my husband’s and my lunches during the week. To make these easy, healthy chicken strips, preheat the oven to 400°F. I like to use shallow pie dishes for breading, but most bowls or plates will work fine. In one dish, beat an egg with a fork. In another dish, add about 1 1/2 cups of panko bread crumbs and season with salt, pepper, garlic powder and thyme. Give the mixture a quick stir to combine. Panko bread crumbs are flaky bread crumbs most commonly used in Japanese cuisine. I think they add a nice texture to the chicken strips that regular bread crumbs don’t provide. However, if you prefer to substitute regular bread crumbs in this recipe, feel free to do so! Before dunking the chicken in egg and bread crumbs, coat the chicken in an even layer of flour. I like to lay out a piece of parchment paper for this step because it makes cleanup much easier. 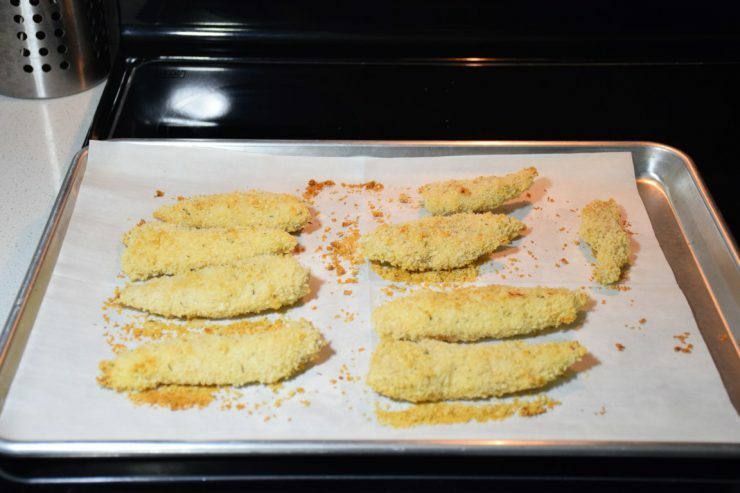 Transfer the chicken breast tenders to the parchment paper, then coat the tenders with flour. Make sure to get all sides of the tenders. Transfer the tenders one at a time to the egg mixture. 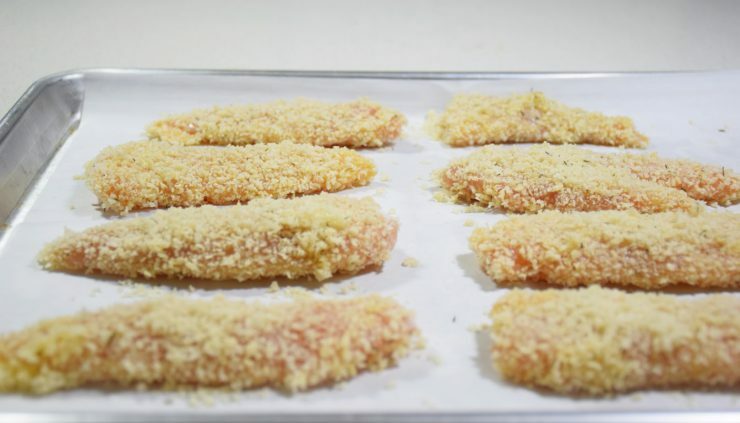 Make sure to cover the entire chicken tender in egg, then transfer to the panko bread crumbs and coat. Place each coated chicken tender on a baking sheet lined with parchment paper. Bake for about 20 minutes, until the breading is golden and the chicken is no longer pink. Let cool for about 5 minutes before serving. Serve warm with your favorite dipping sauce or add to your favorite salad! In a shallow pie dish beat an egg with a fork. In another dish, add about 1 1/2 cups of panko bread crumbs and season with salt, pepper, garlic powder and thyme. Give the mixture a quick stir to combine. 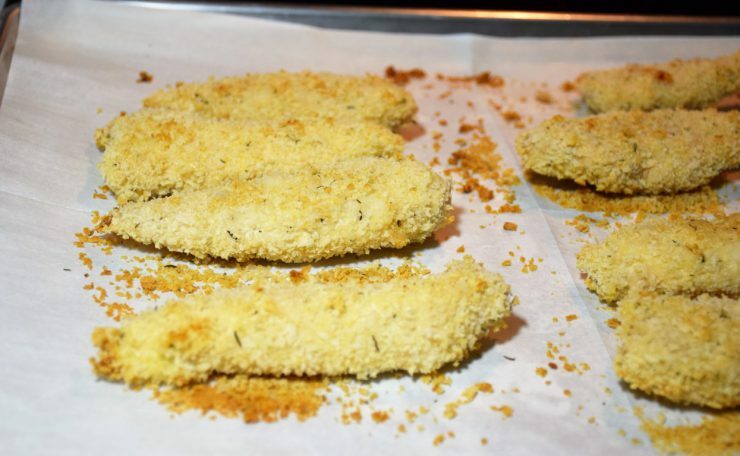 On a piece of parchment paper, coat the chicken tenders in a light, even layer of flour. 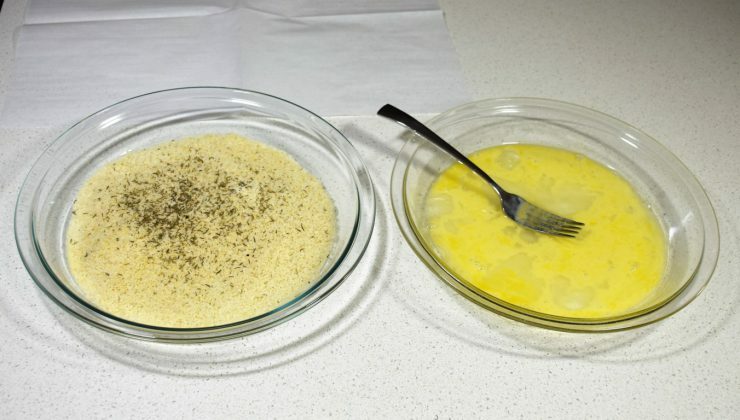 Transfer the tenders one at a time to the egg and coat, then coat the tenders in the panko mixture. 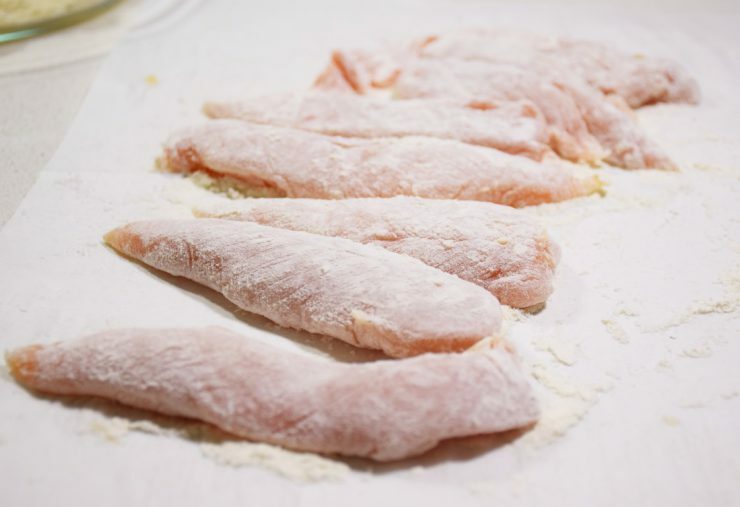 Transfer the tenders to a baking sheet lined with parchment paper.